The village of Bunmahon in 1914 – 1915 as Edith saw it during her visits. Edith Collier Village by the Sea oil on canvas. Collection of The Edith Collier Trust, on long term loan to the Sarjeant Gallery Te Whare o Rehua Whanganui. 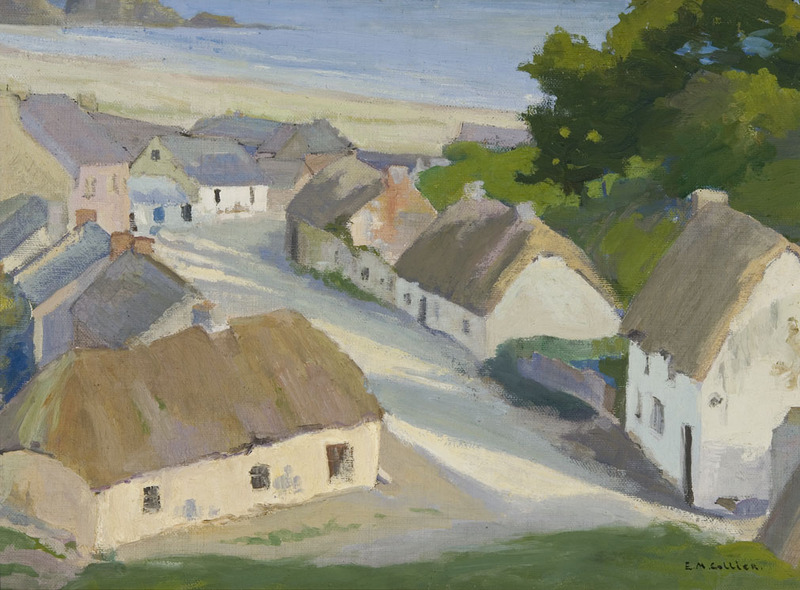 Whanganui born painter Edith Collier (1885 – 1964) has recently been remembered and celebrated by the people of Bunmahon, a small village on the coast of County Waterford, Ireland, which Collier visited 100 years ago in the summers of 1914 and 1915. In September 2015 the former mining village marked the centenary of when Collier lived and worked among them with an exhibition of framed reproductions selected from the 70+ paintings, drawings and woodblock prints she produced at the time. The exhibition was held at the Copper Coast Geopark visitors centre in Bunmahon, near the site of Collier’s studio and lodgings, and the Coastguard Cultural Centre in Tramore, County Waterford. 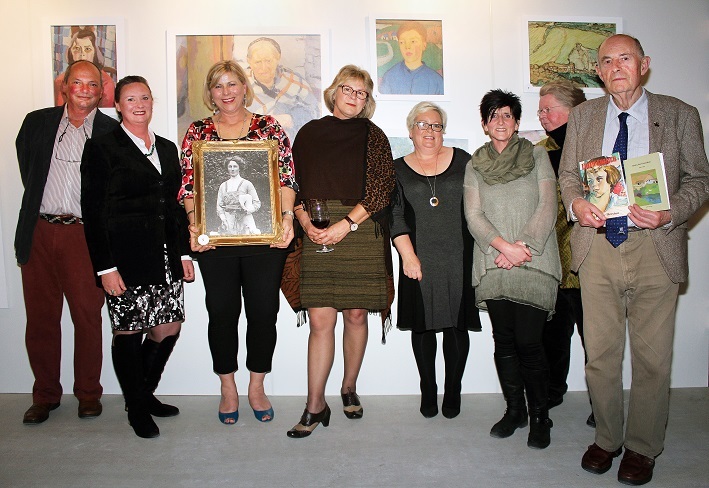 Fiona Horrocks, Chair of the Edith Collier Trust, and her sister Miranda Stewart, both Whanganui residents and great nieces of Edith Collier’s, travelled to Ireland for the opening of the exhibition and were treated like royalty during their stay, due to the fondness and high regard with which Collier is still remembered by the community. Many of the people organising the exhibition are descendants of the subjects in Collier’s portraits and were able to identify their names and information that had previously been unrecorded. During the centenary celebrations a walking tour was conducted around the Bunmahon area showcasing the places Collier painted. Fiona and Miranda were able to visit some of the sites and houses so familiar to them from Collier’s work. A booklet was also published about Collier’s time in Bunmahon. Edith Marion Collier was born in Whanganui in 1885. Apart from nine years in the UK from 1913 – 1921, the rest of her life was spent in her hometown, where she died in 1964. Collier showed artistic and musical talent from an early age and was encouraged by a neighbour of the Collier family, the artist Herbert Ivan Babbage, to continue her training overseas in the UK. 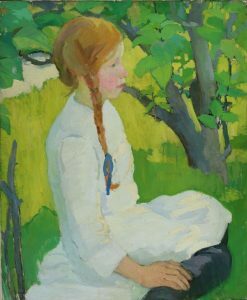 In 1912, at the age of 27, Edith Collier joined a number of enthusiastic New Zealand artists of the time and left for England to become an expatriate. 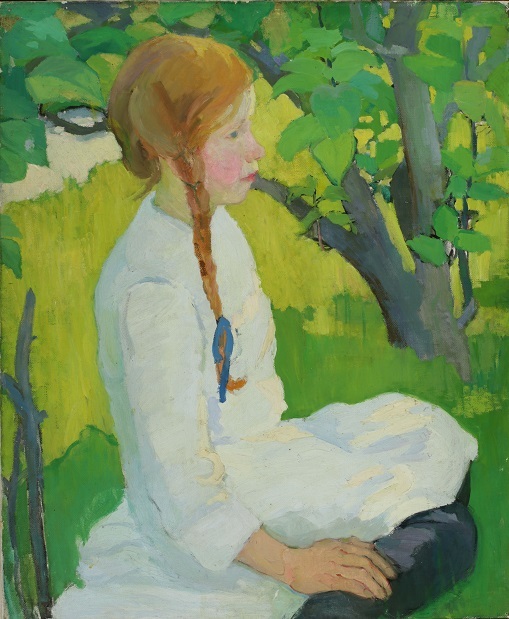 Edith Collier Girl in the Sunshine oil on canvas. Collection of The Edith Collier Trust, on long term loan to the Sarjeant Gallery Te Whare o Rehua Whanganui. Now known to be a portrait of Beatrice Porter as a child dated 1914-1915. The decision was to have a great impact on the subsequent development of her artistic career. First at St John’s Wood Art School in London, then onto Bunmahon, Southern Ireland; Bibury in the Cotswalds; and St Ives, Cornwall where Collier experienced the freedom and experimentation that artist colonies in these areas provided. Influential teaching and friendship were provided through Margaret Macpherson (later Preston) and Frances Hodgkins. What resulted was a relatively brief period of rapid development of style, subject matter, colour and form and the establishment of her significance in New Zealand’s history of art. The majority of Edith Collier’s work and archives are held in the Edith Collier Trust collection at the Sarjeant Gallery Te Whare o Rehua Whanganui. The reproductions for the Bunmahon exhibition were supplied by the Sarjeant Gallery with permission from the Edith Collier Trust. Collier’s Bunmahon works can be seen in Coastal Communities an exhibition of Collier’s paintings and prints of Ireland, Cornwall, and Kawhia, are on display at Sarjeant on the Quay (13 February – 1 May 2016). The Bunmahon booklet and reproductions of Colliers work are available for purchase in the Gallery.